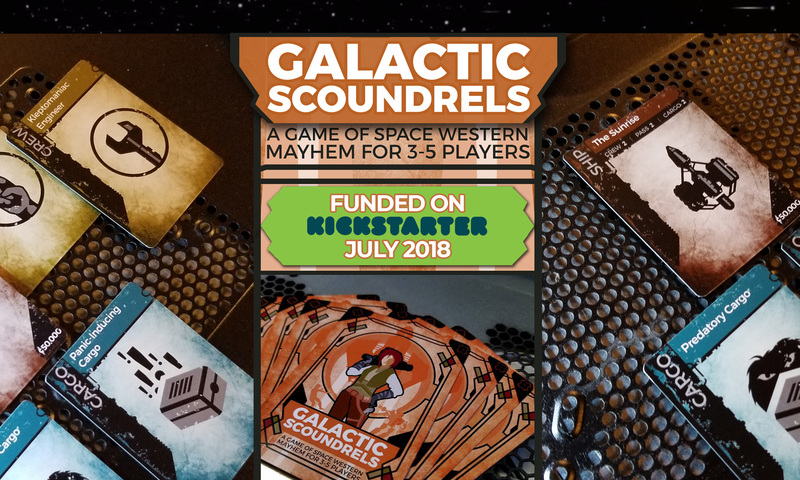 Galactic Scoundrels is a card game of gambling, lying, dirty dealing, and crazy storytelling. Each player is a two-bit ship captain who’s looking for a job with a fat payoff. Players gamble to win each job. Once someone wins a job, the remaining players play a series of cards to try to stop that player from finishing it. While they’re doing that, they’re also telling the story of the job as it happens. Once the job is complete, the player who finished it takes home some dough. Then, the whole thing repeats until the money’s used up and one player’s got more of it than anyone else. See our “How to Play” section. The game will be available after February 20, 2019 for sale from our publisher Mercury Games. This means that if you’re in the US, you can order it from your favorite local game store. The stock code is MCY-1802 (this usually makes it easier for the game store to find). You can also find it on Amazon.com as well as many other online toy/game retailers. We believe we’ve made a great game. We want to share that game with the world. Kickstarter allows us to do that while still retaining control over our work. All of the design for the game is complete, so we just need the capital to order the print run and ship the game to our fans. Is this a Firefly game? Galactic Scoundrels draws inspiration from the best space scoundrel stories, but it’s not tied to any of them in particular. It’s a game made for people who love Firefly, Star Wars, and all those other sci-fi tales which include morally questionable protagonists causing mischief. We love that stuff, so we made a game for others who do too. What’s the recommended age range for the game? The game is recommended for players 13+. Mainly this is due to adult themes. Scoundrels can get into some sticky situations. A lot of that depends on you. If your players love to spin yarns and riff off one another’s zany ideas, the game can go on for quite a while. If you’re all business, and work through things without much fuss, it’ll be quicker. A single playthrough includes roughly six scoundrel tales, and each one takes about 15-20 minutes. In testing, first time players took about two hours to play. Repeaters were closer to 90 minutes.